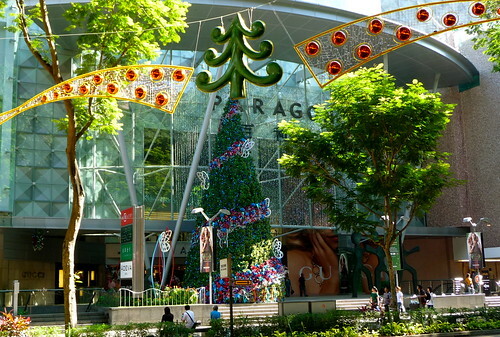 Year after year, shoppers along Orchard Road are dazzled by the spectacular Christmas tree put up by the Paragon. The posh shopping mall never fails to come up with trees sporting the most sophisticated designs that befit its upscale status. In the past, they put on their creative hats and decorated their Christmas trees with stars, strings of pearls and dancing fairies. This time round, they have opted for a whimsical display comprising illuminated butterflies fluttering above thousands of lights. It looks stunning at night! In the day, the Christmas tree actually looks quite ordinary. A band of red and blue flowers twirl around the tree. Other than that, the design is rather plain without the bed of lights. Check out the Christmas trees by Paragon in the past years. Looks much better at night. I agree with you. Good decor, in my humble opinion, should look both as good in the day and at night. This is where this tree falls short, I think.